Both major party candidates in this election are unusually unpopular. Young people in particular are unenthusiastic about Trump and Clinton — polling earlier in the election suggested that somewhere between 15 and 44 percent of millennials were planning to vote for a third-party candidate. We wanted to hear from these young voters who are dissatisfied with both Trump and Clinton and have decided to vote third party. Here is a 21-year-old explaining why he’s voting for the Green Party’s Jill Stein. You can also check out our story from a 21-year-old Libertarian voter. I was 19 when Eric Garner was choked to death by the police. Seeing that video of his death over and over again as it spread across Facebook felt like waking up to reality. Within days, I joined my first political protest: a “die-in” in my college’s student center, symbolizing our stand against police brutality. I’m now 21 years old, in the midst of my senior year at Simpson College in Iowa, and this will be my first time voting in a presidential election. Systemic racism is the most important issue to me, and my views on that topic and many others are far to the left of both Trump and Clinton. That’s why I’m choosing to vote for Jill Stein in my home battleground state of Iowa. I face a lot of stigma for my choice to vote third party. People tell me I’m wasting my vote, or that I’m just trying to be different. But they are completely missing the point of why I’m choosing to do this. To me, my vote represents a moral choice. It reflects who I am as a person. I grew up in a small town of under 2,000 people in the conservative heartland of Iowa. I never cared about politics when I was younger — my household was fairly apolitical, and my parents rarely discussed it. It wasn’t until I went to Simpson College, a couple of hours away from my hometown, that I started gaining an interest in politics. I started as a criminal justice major, where I began to study how our justice system unfairly targets black and Latinx communities. I learned about the oppressive and brutal relationship between the police and these groups throughout our nation’s history, and about how unfair sentencing contributes to systemic racism. From there, I started to connect the dots in my sociology classes, seeing how powerful groups in our society oppress not just black and Latinx communities but women, members of the LGBTQIAP+ community, and other marginalized groups across the globe. When Garner’s death and so many subsequent police killings went viral on social media, it started to feel like everything I was learning about in class was playing out in front of me. I got political, participating in a die-in protest in our student center. I fought for gender-neutral bathrooms on campus. I participated in walks against all systems of oppression. I am a Marxist, a radical feminist, and the child of a Laotian immigrant, so it’s obvious why Trump doesn’t speak to me. His hateful and bigoted language, such as the recent recordings where he discussed sexually assaulting women, is appalling. I’m particularly disturbed by his law-and-order rhetoric. I read that he claimed police are the most discriminated-against group in America right now. I’m truly flabbergasted at that statement. As for Clinton, her views and many of the stances taken up by the Democratic Party are just not progressive enough for me. I’m turned off by her connections to big business and capitalism, her support of fracking, and her hawkish support of Israel. Most of all, I’m disappointed by how slow she was to get on board with the Black Lives Matter group, which is the movement I’m most passionate about. While I appreciate that she has largely come around to it, I don’t see evidence that she really gets the core of the problem. Black Lives Matter emphasizes intersectionality, which is the idea that one’s social identities are inseparable and all significant when considering how marginalized groups are oppressed. I see Clinton as a person who does not have an intersectional mindset. How can she say she supports the black community in our country but then continue to support Israel as it violently occupies Gaza, where black Palestinians live? She lacks the globally progressive view that I want in a candidate. Jill Stein has been my candidate for years, and the Green Party has always been my affiliation of choice. She is the only candidate who recognizes the historical and systemic scope of racial issues. I admire that she lets people of color speak for themselves about solutions and experiences with police violence. I can’t think of any misgivings I have with Stein’s positions. 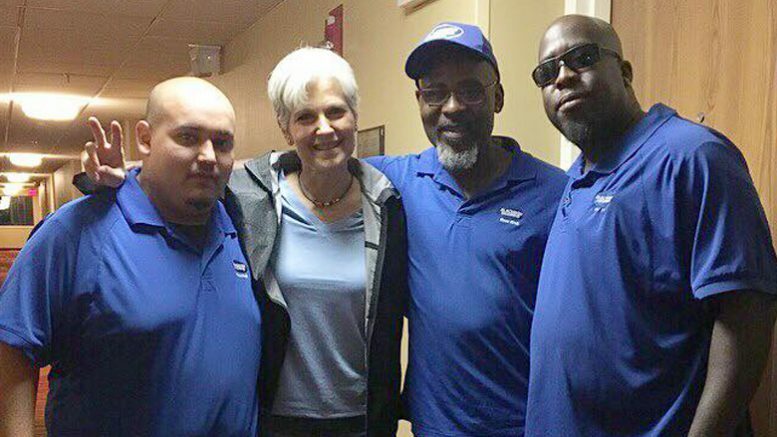 Some people like to bring up her comments on vaccinations as a criticism, but Stein has praised the positive effects of vaccines and has only questioned the influence of big pharma on recommendations. She is a doctor with extensive medical training — why are people so dismissive of her on this issue? People are quick to judge me or get angry with me when they learn about my intention to vote third party, especially on social media with comments, statuses, or shared memes. My peers tell me that I’m wasting my vote, that I’m lazy, or that I’m just trying to be seen as different. Older voters tell me over and over again about the Nader election, when the Green Party candidate supposedly split the progressive vote and gave the reins over to Bush. Regardless of who is getting mad at me, they always use the same argument: that I’m giving the election over to whichever candidate they hate the most. How can I be helping and hurting both Clinton and Trump at the same time? People just want to get mad at anyone who isn’t voting for their team. I really don’t see my vote as a waste. Yes, I am fully aware that either Trump or Clinton will definitely be president. And, yes, I know that I’m in a swing state where the stakes are higher. But that doesn’t mean that my third-party vote doesn’t count for anything. To me, it is a deliberate stand against the two-party system. It’s a stand against the Democratic Party, a way to communicate to them that they need to address the more progressive wing of this country and shift their policies to the left. It’s just one part of a larger movement that includes electing third-party politicians on a local level, grassroots activism, and change from the bottom. We need to chip away at the system at every level. It’s hard to say why so many millennials are voting third party. Among my peers, most are in the bag for Clinton because they are so scared of a Trump presidency. But overall, I feel that our generation is much more progressive than the older generation. We grew up in the Obama years, under an administration that gave us the Affordable Care Act and passed laws to protect marriage equality. I think people my age are hungry to move even more toward the left. Hillary, with her moderate views and establishment attitude, is not going to be that champion. That’s why I’m standing for Stein. I can cast my ballot without guilt, knowing that she represents who I am as a person. People tell me to compromise and vote for the lesser of two evils — but I cannot compromise when it comes to my beliefs, especially when they involve human rights and systemic oppression. If Stein didn’t happen to fall deeply in step with my views, I would abstain from voting entirely. I vote based on principle, not because of party loyalty. It is a moral, not a pragmatic, act. Shawn Schossow is a senior double majoring in sociology and philosophy at Simpson College. After graduation, he wants to pursue a PhD in sociology.